You remember a few weeks ago I ran the Ultimate Kitchen Clear Out, I am sure some of you joining in the fun! Well, I had several requests to run something similar to tackle the whole house. It took me a while to decide how to set it up, as I wanted it to be doable, easy and affordable plus it had to use my system of baby steps to make it achievable. 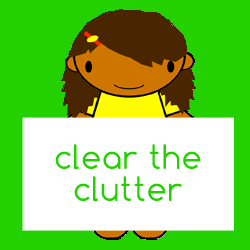 Well, here it is... Clear The Clutter! I was surprised by the reaction to the Kitchen Bootcamp, the Facebook group was AMAZING, we had so much fun, I laughed so much and everyone who stuck with it ended up with a beautifully organized kitchen. There were lots of revelations and A-ha moments, quite a few really odd/old items found, lots of stuff cleared out and praise from family members, not only that so many of the people who joined thanked me for motivating them and helping them to get through such a mountain of a task. If you want to read some of the feedback, check it out here.